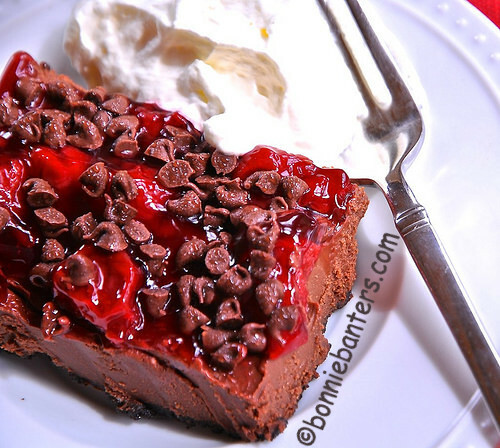 Attention all chocolate lovers...this is the most easy, decadent chocolate dessert you can imagine! I served these fantastic bars at a recent family gathering, and they were a huge success! Scrumptious, easy treat for family and impressive, rich dessert for guests..you're gonna love them too! Here's A Nice Slice Just For You...Enjoy! Spray a 9" x 13" glass baking dish with the butter-flavored cooking spray and set aside. Microwave the butter and chocolate for 30 seconds in a microwave-safe bowl on 50% power and stir until completely combined. Combine crushed cookies or the broke up pie crust with the butter and chocolate mixture. Using the back of a silicone or plastic spatula sprayed with the cooking spray, carefully press and distribute the mixture into the prepared baking dish (the crust will be thin). Place in the fridge to chill while you prepare the mousse. In a medium-sized bowl, beat the cream cheese and creme de cacao (or almond extract) with an electric mixer until smooth. Set aside. In a microwave-safe bowl, combine the 16 oz. of bittersweet chocolate chips with the 1 1/2 c. of whipping cream and microwave on high in 1 minute increments, stirring after each, until almost melted. Stir until smooth. Gradually add the melted chocolate chips and whipping cream mixture to the flavored beaten cream cheese, beating until smooth. Remove the chilled crust from the fridge and carefully and evenly spread the chocolate mousse over the crust. Return to the fridge to set for about 30 minutes. Take the mousse out of the fridge again and carefully and evenly spread the cherry pie filling over the top. Sprinkle evenly with the miniature semisweet chocolate chips. Let chill and set in the fridge for 24 hours. When ready to serve, remove from the fridge and cut into about 2" x 2" serving bars and garnish with a dollop of the chilled whipped cream on the side. While the chocolate mousse bars are setting in the fridge, chill a bowl to prepare the whipped cream (at least 1/2 hr. before you whip the cream). In the chilled bowl, beat the whipping cream with the powdered sugar until soft peaks form and the mixture holds its shape. Set aside in the fridge until ready to serve. As with any recipe, thoroughly read the recipe before gathering the ingredients and preparing. This is a very easy recipe to be so decadent, but it is divided into steps. I used Ghirardelli chocolate baking chips. Enjoy all you want...there's plenty and they are easy to make!